A motorcyclist is killed each day on Texas roadways. To improve safety and commemorate the 455 Texas motorcyclists who lost their lives in 2015, the Texas Department of Transportation has launched an educational campaign for May’s Motorcycle Safety Awareness Month. This will hopefully decrease the number of motorcycle accidents on the road. The “Share the Road: Look Twice for Motorcycles” initiative urges vehicle drivers to take special care to protect motorcyclists sharing the roads. Those who ride motorcycles are five times more likely to sustain injuries in an accident than vehicle occupants. They are also 26 times more likely to die in an accident. 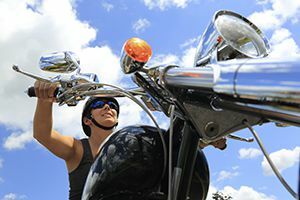 This increased risk can be associated with the lack of safety features on a motorcycle; there are no seat belts, sturdy frames, or airbags to protect riders. If you or someone you love has been injured or killed in a motorcycle accident at no fault of their own, reach out to our auto accident attorneys in Tulsa at The Edwards Law Firm. Approximately 50 percent of fatal motorcycle accidents involve colliding with trucks and cars, where many vehicle drivers report never seeing the motorcycle or not accurately judging their speed. Texas transportation officials are urging vehicle drivers to be more observant on the roads in efforts to reduce the number of motorcycle collisions, injuries and fatalities. Officials note it is especially important for drivers to thoroughly assess the roadways before entering an intersection or making a lane change. Before making any maneuver, look twice for motorcycles. Always use your turn signal when making a lane change. Always look in your mirrors before shifting lanes. Keep a significant distance when following behind a motorcycle. Don’t assume motorcycles are far from your vehicle; act as if they are closer than you believe. Throughout the month of May, the Texas Department of Transportation will be visiting Texas communities, providing citizens with opportunities to learn about motorcycle safety through a variety of activities. If you or someone you love is injured or has died in an accident, our motorcycle accident lawyers can help you recover fair compensation. Schedule a consultation today.